This bakeware set includes all of the pieces you’ll need, and none of the extras that will gather dust in your pantry. The bakeware has a heavy-gauge steel core that heats evenly and the rolled edges prevent warping during baking. Meanwhile, the toffee-colored surface looks elegant and helps prevent over-browning. The nonstick surface has interlocking layers that make the bakeware much more nonstick, while it’s also very durable – it’s even dishwasher safe, although it’s very easy to wash by hand. The bakeware is oven safe to 450 degrees, which is much higher than you’ll need for your cakes, cookies, and brownies. When you’re not baking, you can use these same pieces for roasting vegetables, baking a meatloaf, or reheating leftover pizza. The pieces include two 8-inch round cake pans, so you can make both layers of a cake without waiting for a pan to cool; one medium loaf pan for bread or quickbreads; one 9x13 inch cake pan for sheet cakes, brownies, and casseroles; one 12-cup muffin pan, and one 10x15 inch baking sheet for cookies or for roasting vegetables. Once you’ve mastered basic frosting techniques, this set will take your decorating to a whole other level as you use the included pastry tips to swirl roses onto cakes or cupcakes, or you add ruffles to the sides of a cake. Round tips let you write messages or draw thin or wide lines, and leaf tips let you make leaves or other designs. But it’s not just tips. This set also includes 24 disposable pastry bags to get you started with decorating, a coupler for easily changing tips, a bag cutter so you don’t need to hunt for scissors, a tapered spatula, and a locking storage case so you can keep all the pieces together. Instructions are also included, so you can make pretty designs right away. The tips included in this kit are round 3, 6, 12 and 2A; star 16, 21,1M, 48 and 32; petal 104 and127; leaf 352 and 366; specialty 233; basket weave 48; ruffle 86; and Drop Flower 129 and 2D. Need some more help finding what you're looking for? 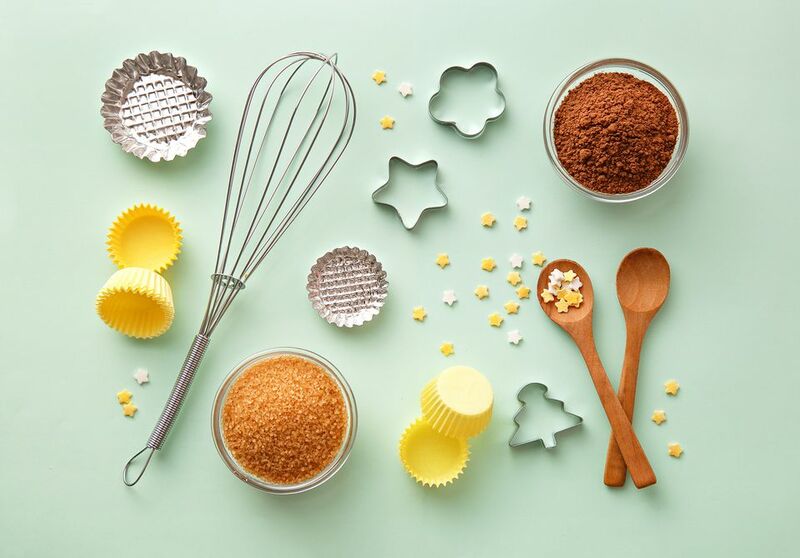 Read through our best cake decorating tools​ article. I’ve had this cooling rack set for years, and although I have others, these are the ones I reach for first. They have a nonstick coating so warm cookies won’t stick as they cool, and each of the three racks has folding legs so they leave plenty of air circulation below. The racks easily hold 12 cupcakes each, and the legs fit neatly into the rack below, so you can stack the racks to cook a lot of cookies or cupcakes while using less counter space. Speaking of space, the legs fold so the three racks take very little space in storage. Each rack is 15 7/8 x 9 7/8 inches, and these are dishwasher safe, although it’s just as easy to wipe clean with a sponge to save dishwasher space. Because of the coating, these racks are not oven safe. When it comes to mixing bowl sets, these check most of the really important boxes. The three-piece set includes very useful sizes: 1 1/2 quart, 3 quart, and 5 quart, so you’ll always have one that’s the right size for whatever you’re mixing. Even better, they nest for compact storage. The metal interior won’t stain, crack, or chip, even when you’re using an electric beater on high speed. The plastic exterior looks good and helps shield your hands when you’re working with very hot or very cold ingredients in the bowls, since the dual layers acts as insulation. The insulation also helps keep ingredients warm or cool. The non-skid bottoms mean the bowls won’t wander around on your counter, and they won’t leave dark marks on the counter surface, like stainless steel bowls often do. When you’re not using these for mixing, the stainless steel interior means you can use them for storage in the refrigerator or for marinating foods. They’re also attractive enough to use for casual serving, and they are dishwasher safe for easy cleaning. The one downside to these bowls is that they’re not microwave safe, as glass bowls are, so you won’t be warming chocolate in the microwave in them. Otherwise, they’ll do just about everything you need. After too many years of using an ordinary knife to frost cakes and cupcakes, thinking it was good enough, I finally broke down and bought an offset spatula and I was amazed at how much easier it was to neatly frost a cake or cupcake. This spatula is made by a company that’s been producing professional cooking equipment for over 100 years, so they know what they’re doing. The handle is polypropylene, which is comfortable to hold onto and makes this spatula dishwasher safe, and the blade is taper-ground, so it’s evenly flexible for better control. Besides using this for frosting cakes, you can use it to loosen the sides of baked cakes that are hugging their pan, or slip it under cookies to help release them if they’re sticking. Once you own one, you’ll wonder how you managed without it. While it’s possible to measure wet ingredients in dry measuring cups, it’s not accurate. And then you’ve got a wet measuring cup that needs to be dried before you dip it into the sugar canister. This set of wet measuring cups is shaped like beakers, so they nest perfectly and they have spouts that make them easy to pour accurately. Each beaker has its maximum measure, with graduated marks for smaller amounts. The bottoms are flat and very stable, so they won’t tip while you’re filling and you can measure amounts in advance and leave them waiting to be added to your mixing bowl. The set includes one cup, 2/3 cup, 1/2 cup, two ounce, one ounce, one tablespoon, and 1 teaspoon beakers. These are top rack dishwasher safe for easy cleaning. These are the measuring cups I reach for all the time. This 7-piece measuring cup set has the standard sizes that you use every day, plus a few extras that you’ll like more and more as you use them. Sure, you can dip the 1/4-cup measure into the sugar canister three times, but it’s so much easier to use the 3/4 cup once and save the 1/4-cup measure for the cornstarch. Plus, you don’t need to count or remember how many times you’ve measured. These are made from stainless steel, so they won’t stain or rust, and they’re dishwasher safe for easy cleaning. Most of the set sits flat on your counter when empty, but the smallest don’t balance as well unless they’re full. The set includes 1 cup, 3/4 cup, 2/3 cup, 1/2 cup, 1/3 cup, 1/4 cup, and 1/8 cup. They’re marked with both American measures and metric, so you can convert recipes with ease. When you’re done baking, they nest neatly for storage. Whether you’re digging into spice jars or measuring salt or sugar, these spoons have you covered. The slim shape fits into jars and is easy to level – and a leveler is included, so you don’t need to hunt for a knife with a flat edge. The set includes six different spoons and they include both American and metric measures so you can convert recipes with ease. They’re made from chrome-plated stainless steel so they’ll always look good, and they’re dishwasher safe for easy cleaning. The set includes 1 tablespoon (15 ml), 1 teaspoon (5 ml), 3/4 teaspoon (3.75 ml), 1/2 teaspoon (2 1/2 ml), 1/4 teaspoon (1 1/4 ml), and 1/8 teaspoon (0.6 ml). The ring lets you remove spoons from the ring easily and replace them when you’re done, so you can hang them on a hook or keep them together in a drawer.